Loss of your best-interview-ever recording due to a “media error” message from your recorder can be devastating. Compact Flash cards, SDHC cards, and Memory Sticks rarely fail; however, your treatment of these media cards can have a dramatic effect on your sound-gathering success. Most audio loss due to media error can be avoided by practicing these habits. Protect your media: Use a protective case when not installed in a machine to minimize exposure to extreme temperatures, humidity, dust, and bending. 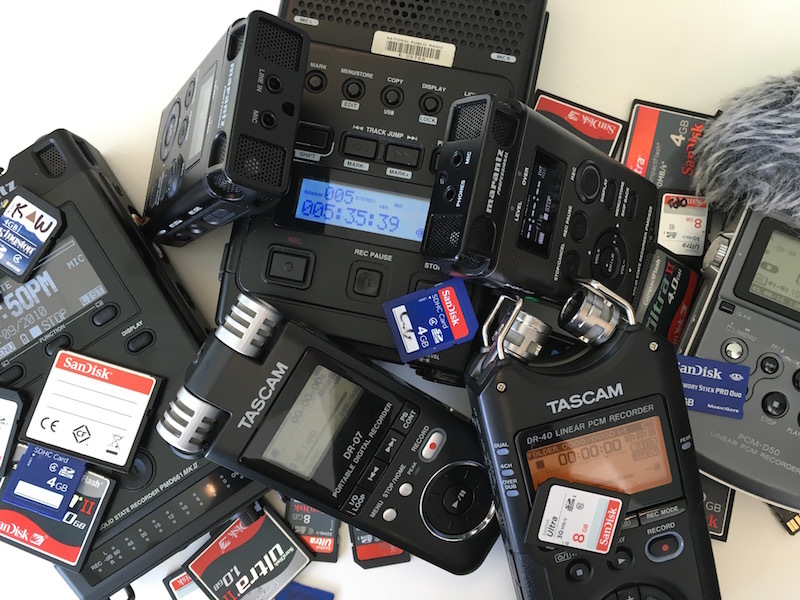 Use manufacturer-approved brands/models of media for your audio recorder: The list is typically found in your recorder’s user manual. Use YOUR audio media cards in YOUR audio device ONLY: Not in cameras, not to loan, not for data transfer, etc. Throw away suspect media cards immediately! Don’t risk your recordings and reputation for an iffy $30 media card. Format your media cards: And do it IN YOUR AUDIO RECORDER before every use. Always have back-up: Take spare formatted media cards on every assignment. Test first: Record and playback a quick test file immediately prior to recording on site. If the media is fussy in the least, toss the current card and re-test with a spare. For long recording sessions: Instead of creating one long file, create new audio files occasionally (typically by pushing the record button again while recording.) If your recorder displays a media error message when you stop recording, you may have only damaged the current file, possibly sparing previous files for retrieval. Avoid wear and tear: Consider leaving your media card in the audio recorder and transferring files via USB cable. Using an external media card reader is fine but does cause gradual wear and tear on the card and recorder from repeated insertion and removal. Never: Remove a media card from the recorder or computer while it is reading, writing, or transferring data. Always eject or dismount the card before removing.